What Makes a Top Recruiting Firm, Anyway? If you want a good laugh, do a quick Google search for “top recruiting firm.” Seriously, go ahead, do the search. Now, what do you notice? Probably the same thing we noticed. Nearly every recruiting firm out there, big and small, new and well-established, is using the phrase “top recruiting firm” on their website. Now, let’s be realistic. We can’t all be the top recruiting firm in the country, or even, realistically, in our niche. There is no national certification that says: “Hey, your company is the top recruiting firm in this industry!” Before you even think that it’s a keyword phrase, according to Google’s keyword tool, only 1,300 people search for the phrase on a global basis each month. Only 1,000 of those are in the United States. So honestly, no one cares that the phrase is used. Before you run and delete the phrase from your website, take a moment and reflect on why you used it in the first place. Are you honestly one of the top three companies in your chosen niche? Do you have the profits to claim this, or is the designation “top recruiting firm” based on something else? Your clients do not care if you make more money than any other recruiting firm out there. They really don’t. What your clients care about is the service you provide, how efficient you are, and how reliable your results are. A “top recruiting firm” is subjective to the person making the claim. What matters most is that every last one of your clients and candidates feels that you are the best at what you do. So How Can My Company Become a Top Recruiting Firm? Be Honest when you make promises, especially those regarding time lines. If your client wants the position filled in a week, but your recruiting process takes two, explain the benefit of your process and be firm about your deadlines. Rushed jobs never benefit anyone. Communicate with your candidates and clients, even when the news is not good. Follow up after each stage of the recruiting lifecycle. Make yourself available by phone, email and when possible in person. If you communicate openly and frequently with your clients and candidates there will be less unpleasant surprises along the way. 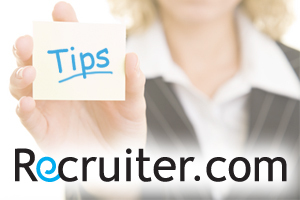 Educate your candidates, even those you cannot place immediately. Taking a few minutes to provide constructive feedback after interviews that did not go well show that you care about the candidate. You never know which of today’s candidates will be tomorrow’s hiring managers, and your candidates will not forget how they were treated by your team. Over deliver on every promise you make, and don’t make promises that you cannot complete. If you promise your client you will find three candidates, send five. If you promise your candidate you will market them to ten companies, market them to a dozen or more. Your goal should be to outshine everyone and everything, including your own expectations. What’s interesting to note is that while a lot of recruiting companies and employment agencies focus on being “the best” and a “top brand,” on a national level, it doesn’t much matter to most clients. A one-man recruiting shop can easily compete locally with the largest companies in the country. Perhaps the only time when breadth and industry standing/marketshare matters is when negotiating for large or exclusive contracts with Fortune1000 firms that have hundreds of locations and international presence. For most recruiters to experience great success, they shouldn’t focus being a top recruiting firm – don’t worry about your relationship to other companies and competitors. Focus on delivering excellent service to every client and candidate that your company comes into contact with. Every step in the recruiting lifecycle should be a high quality, well though-out, and personal experience. If you approach recruitment like this, you’ll be much more successful than the million top recruiting firms out there – forget quantity and focus on recruiting quality.